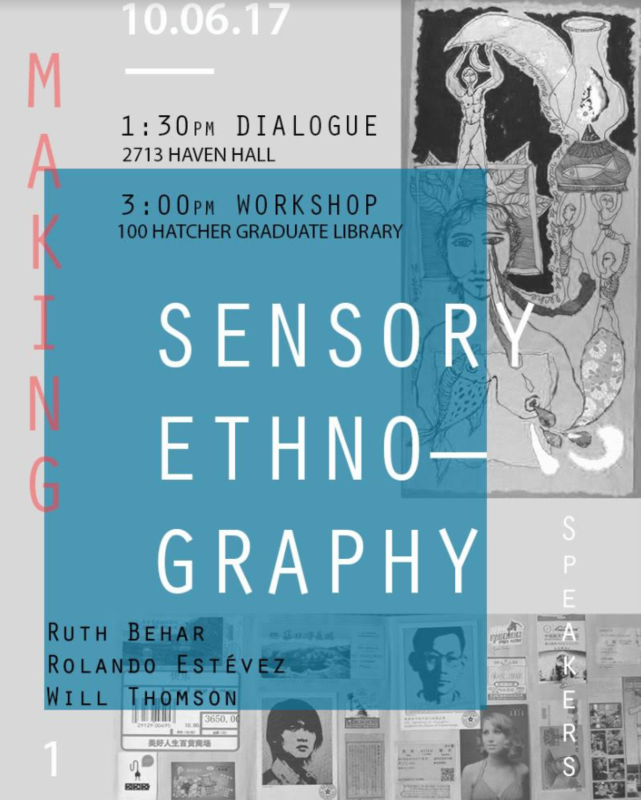 The Rackham workshop, Making Sensory Ethnography (MSE), offers a collaborative and interdisciplinary space for students, faculty, and professionals to showcase unfinished projects and discuss the process of experimenting with ethnographic methods, forms, and content. The workshop convenes around the prefix sensory as a point of inquiry, examining how its conceptual and pragmatic prowess expands, challenges, or aligns with prior ethnographic engagements. The monthly meetings throughout the academic year will include student presentations, invited-speaker workshops, and dialogues that engage varied disciplines and professional fields. The first event, “Scrapbooking: Praxis and Poetics,” will consist of a workshop and dialogue on Friday, October 6. It will feature Professor Ruth Behar, Cuban book artist Rolando Estévez, and Will Thomson, postdoctoral fellow at the Center for Chinese Studies. At 2 pm a dialogue will occur on the poetics of assembling fieldwork materials, followed by a book-making workshop at 3 pm, and end with an informal dinner! * If participating in the workshop, please bring notes and objects as scrap materials!